Alright, so our batch of jerky wasn’t our best effort this time. Still edible – and still about 1000% better than most store-bought crap, but definitely a bit on the dry side. So way back when I first heard about stevia (for those in the dark, stevia is a herb used as a sweetener, it’s related to the chrysanthemum flower, 300x sweeter than sugar and doesn’t elevate blood sugar, cause cavities or feed candida – brilliant stuff) but back then, not available in Canada. I had to try it so I found a supplier willing to ship to Canada. Since it wasn’t legal here, the supplier filled out the customs label with Anonymous White Powder. No kidding, that they let into Canada, but a harmless herb – no way. Crazy! Anyhow, so my search for jerky marinade sans coconut aminos led me to jensgonepaleo.blogspot.com and her A Really Tasty Beef Jerky Recipe, using apple juice as the base. I didn’t have the Penzey’s BBQ 3000 spice she recommends, so I used an equal amount of ground black cardamom, which gave it a nice smoky barbeque flavor. I think next time I’ll also add a little balsamic vinegar to replicate the tangy soy sauce flavor I’m guessing the coconut aminos would give. Just a note for those who don’t know. Tamari is NOT a good substitute for the aminos. Despite how many paleo jerky recipes you’ll find that use it, It’s made from soy, which of course is a legume and doesn’t belong in a paleo kitchen. Not to mention the questionable effects it has on hormones and the fact that virtually all soy grown these days is GMO. No thanks. 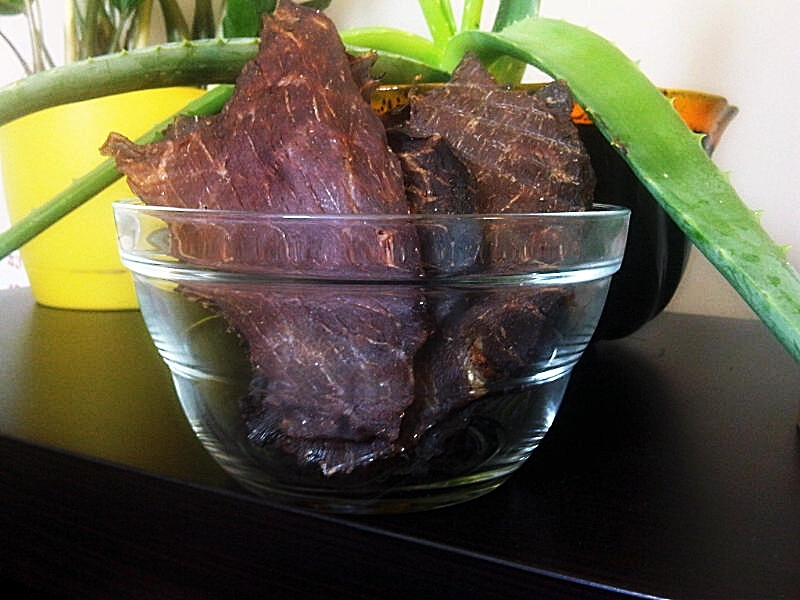 For those toying with idea of making your own jerky – try it! The Food Lover’s Primal Palate has a great post (and a good recipe if you can get your hands on coconut aminos) plus step-by-step instructions using the oven if you don’t have a dehydrator. Like making your own mayo, it’s one of those things that fills you with pride when you’re done. Even if you do accidentally leave them in too long at too high a temperature and end up with tasty beef “crackers” like we did, you can still feel proud that you’re eating a healthy, home-made, 100% paleo and Whole 30 approved snack. 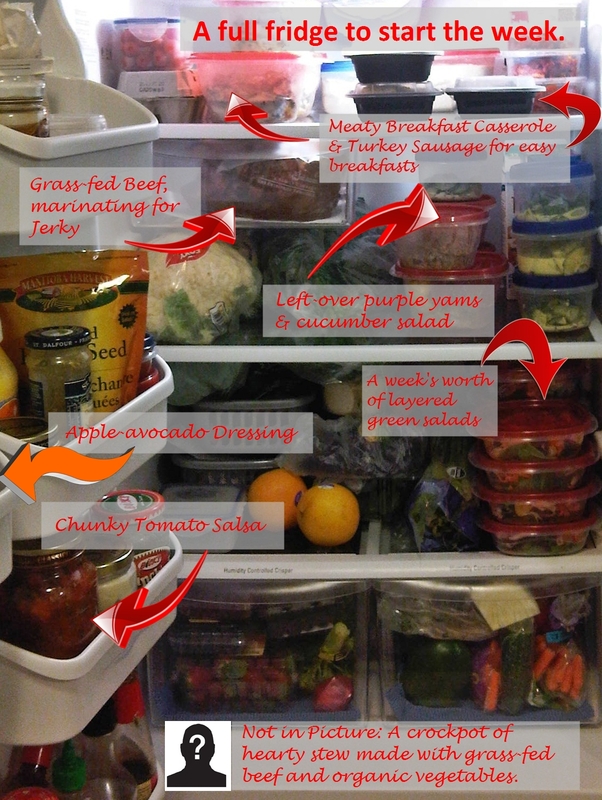 If a picture is worth a thousand words, have a gander at our packed fridge. 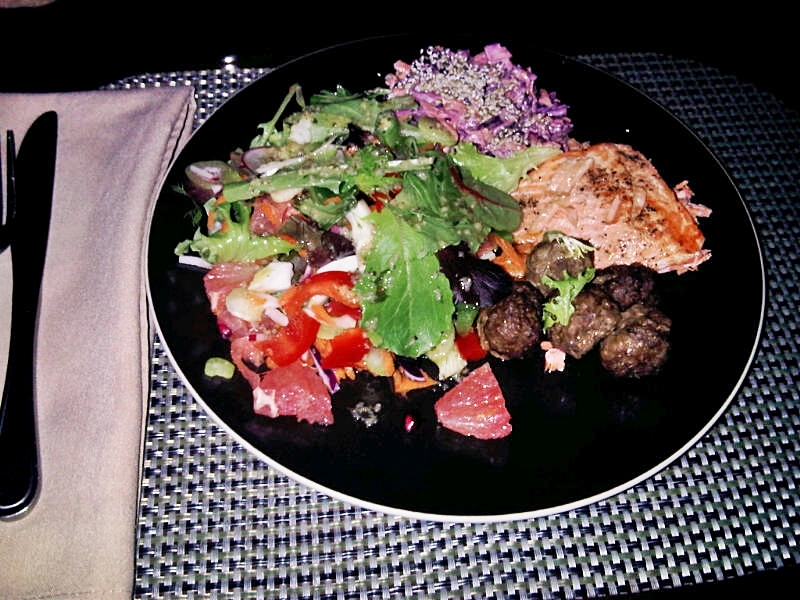 We spent most of Sunday afternoon and evening in the kitchen preparing food for the days ahead. Last week we were in the kitchen every night.Not this week, man! We’re going to have a few batch cook nights and rely on high volume dishes like sheppard’s pie and stew, but we’re planning one three nights per week without kitchen duties! 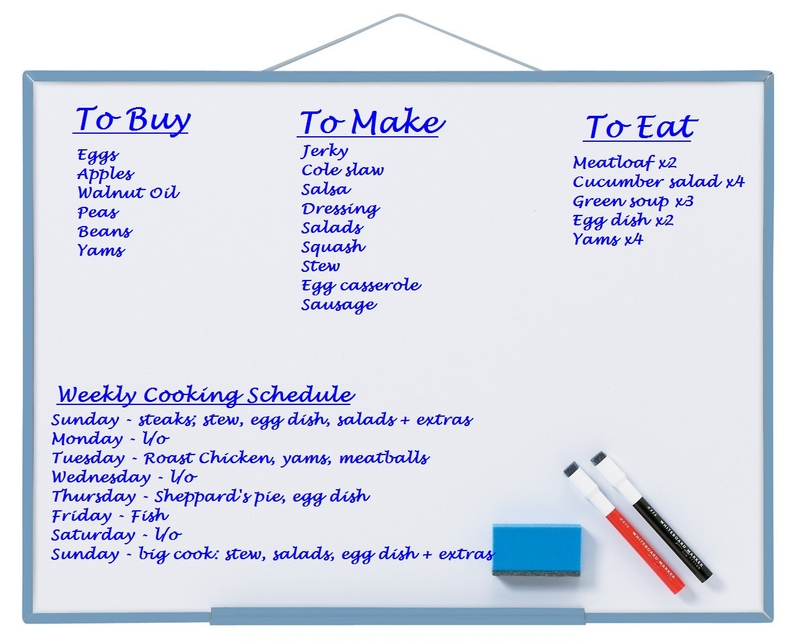 To help make that happen, I decided to rearrange the whiteboard on the fridge to track not only what we wanted to cook for the rest of week, but the groceries we’d need to do so and the resulting leftovers we need to eat. Here’s what we netted for our Sunday efforts: a week’s supply of layered green salads, an apple avocado salad dressing, six portions of a hearty egg casserole with lean beef and turkey sausage, a double batch of chunky tomato salsa, a thick stew made with grass-fed beef and local organic root vegetables and a batch of jerky waiting to go into the dehydrator. It took a little longer than we thought it would, but it feels good to start the week with a fridge full of nourishing food. Guess which one I'm feeling today? Whole 30, day 11. I was scrolling through the Whole30 facebook page reading posts by people at various stages of this challenge and was amazed (and at times, slightly jealous) of the variety of experiences people are having. 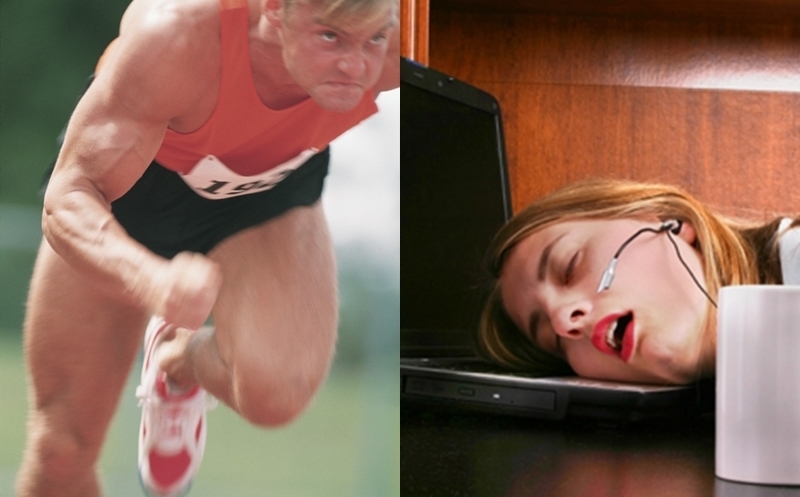 There are people feeling “fantastic” after just a few days, boasting of high energy levels and good moods. There are people “Woot”- ing and going on about their clear skin and loose jeans. Hmph. If I had the energy, I’d almost want to hate ’em. Of course I’m kidding. But I am surprised at how friggin’ drained I am, pretty much all day. Dave’s energy level is pretty stable, but mine is in the toilet. Of course, the facebook page is also full of posts by people feeling equally as lousy, struggling with fatigue and headaches, cravings and bloating…we really are all unique. I thought because our diets were pretty stellar before this great adventure, the transition would be fairly seemless. But I have to remind myself that the body is adjusting, the gut is healing, the metabolism is shifting and these things take time – and energy to process. The posts I’m most impressed with are those about increased awareness, something we’re really noticing too. My draining day ended with car trouble and having to be rescued by my night in a shining pathfinder. And my first inclination as I stepped through the door was “Could I ever use a glass of wine right!” The correlation between emotions and eating is so obvious now. Dave craves crunch during movies out of habit and boredom, or cookies or apple pie because it would taste “fun”. 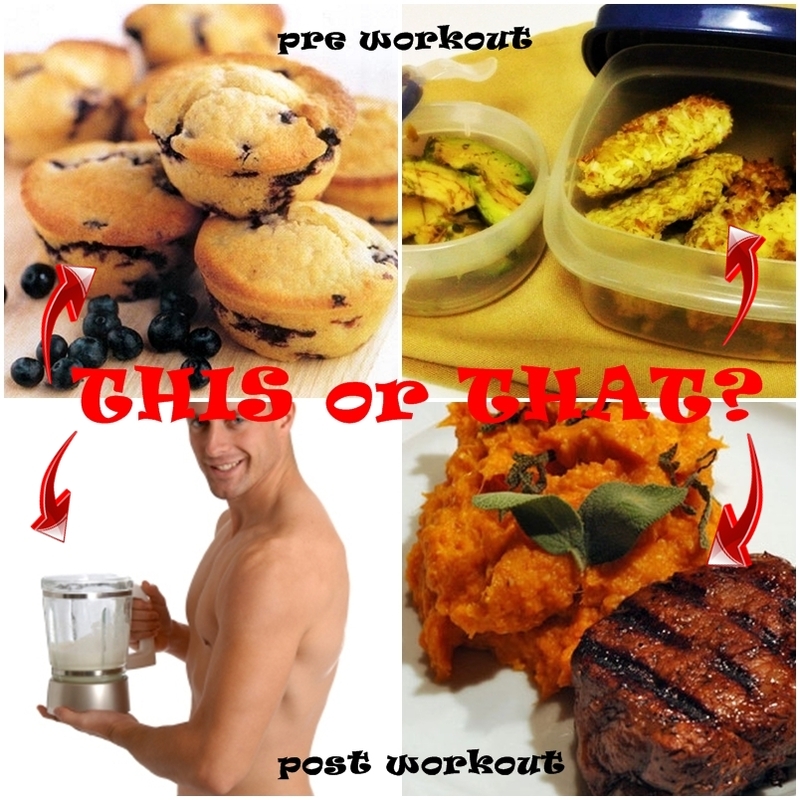 You gotta ask yourself, what are you really feeding – the body or some other need? If I’m really honest, I’ve often fed my boredom, stress and a need for nurturing with “treats” that never really do the trick. Don’t get me wrong, I’ll never be one to eat only for survival. I enjoy cooking and love eating way too much to ever consider it merely a means to and end. But the deeper we get into this Whole 30 challenge, the more I suspect we’ll come out of it with a new clarity about our food choices and a new take on what true “nourishment” really is. Time to hit the sheets. Nighty night all! Today was one of those days where food took a back seat. Though I did have a little spell romanticizing about wine and Dave confessed to craving chocolate. Overall though, our minds were on other things today and we relied mainly on leftovers. God bless bulk cooking. I was still feeling flu-ish so left work early and did a hot yoga class to help speed the detox. Somehow I just knew I’d feel better afterwards and it worked like magic! God bless hot yoga. David had lasik eye surgery today, so food was the last thing on his mind. He ate, but couldn’t really see the food I put in front of him! God bless him. My cooking schedule went out the window today. I’d planned to do make green soup and meat balls, but honestly sometimes you just have to listen to your body. I had exactly enough energy to get tomorrows frittata in the oven and that was it. Speaking of breakfast, our’s was pretty good today: baked eggs, sweet potato hash, avocado and salmon ‘bacon’ (wild salmon skin fried crispy). Lunch was a large salad and leftover Sheppard’s pie (which we could happily eat every day, it’s sooo good. 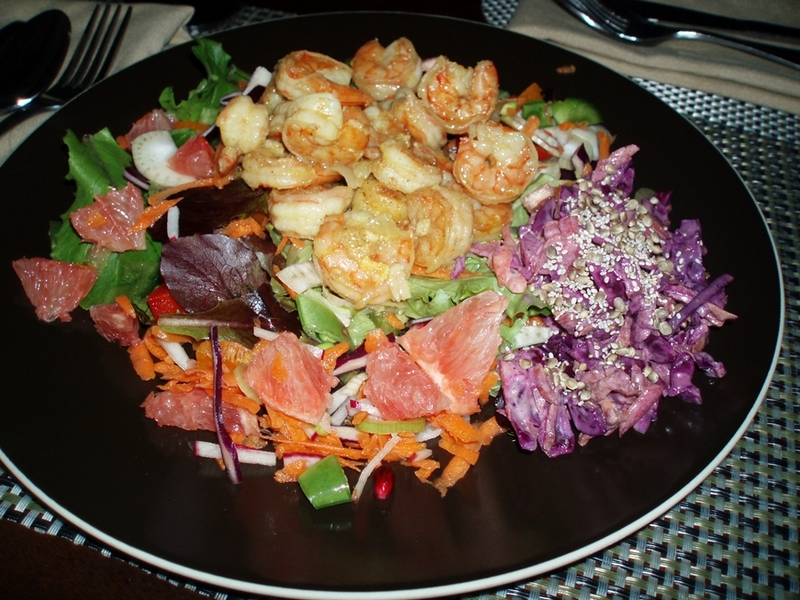 Here’s the recipe from marksdailyapple.com) and here’s a snap of the lazy dinner I threw together, curried shrimp dumped atop a big salad and a side of purple cole slaw. Sometimes you just have to make the best of it.